Discussion in 'Civ4 - Unofficial Patches' started by DanF5771, Jul 4, 2008. AI seems to refuse trades for Bonuses and Civics with a DENIAL_ATTITUDE although it should definitely trade according to the leader's XML thresholds. AttitudeTypes CvPlayerAI::AI_getAttitude(PlayerTypes ePlayer, bool bForced). This seems to return ATTITUDE_CAUTIOUS even though I was FRIENDLY in various tests. which retrieves the Team Attitude the trades work fine! This might cause a multitude of problems throughout the whole game, whenever the PlayerAI's attitude is taken into consideration. What is / Where am I wrong here??? An AI will always redline all Civics in trade screen with a DENIAL_FAVORITE_CIVIC when they are currently running their favorite civic. I'm afraid that's by design. Aaah, a reply, and from Solver himself! But I'm sorry, I just can't follow the idea behind such a design. Should running the favorite civic protect an AI from demands to switch civics in the other civic categories? It regularly frustrates me to see all civics redlined in the trade screen, as this rule poses a major restraint on the human player's possibilities to influence the diplomatic situation in the game. So I get the feeling that this rule "goes against everything good game design stands for!". What do other players think about this subject??? Plus, has anybody reproduced the problems of my first post about the trade denials due to allegedly too low attitude??? Why can there be a difference between player's attitude and team's attitude anyway when the teams consist only of the respective players??? I agree. The protection should only apply to the category of the favorite civic, IMO. It seems logical that a civilisation is unwilling to switch out of its favourite civic. That's a part of their programmed personality. It seems extremely odd that whether an AI is using its favourite civic or not has an effect on its willingness to change its civic choices in unrelated civic categories. I must say that I personally had not noticed this before because I rarely try to influence the AI's civic choices. The odd exception is when they're using the theocracy civic and I want to spread a religion to their cities (without the missionary gifting trick). Solver, are you sure that its a designers choice that whether an AI is using its favourite civic or not has an effect on its willingness to change its civic choices in unrelated civic categories? I'm throwing my personal 2 cents in on the same side as DanF5571, 77alex77, and Roland. The change suggested by DanF makes more sense than the game's current behavior. About the only reason I can see why the designers could have *intended* the game to behave as it currently does, is if DanF's change made it too easy for the player to change AI civics, so the code prevents *any* civic changes if an AI has reached its favorite civic. But even that would be a very crude solution, in this case it'd still be better to apply DanF's change, and then fine-tune the trade value of civic changes. It just doesn't make sense that I can talk an AI into another *political* system right now, but have no chance to do so any more once he applied his favorite *religious* civic. Yes, I'm talking about the refusal to talk about changing civics applying to all of the civic categories instead of just the favourite civic category. That's a bit weird in my opinion. Couldn't that have been a small programming error where the designers intended the refusal to apply to the same civic category but accidentally let it apply to all civic categories? I can imagine that some small communication error between designers and programmers or just a small programming error could lead to such non-intuitive AI behaviour. I find it hard to rationalise the present AI behaviour. Might I ask: What are your arguments against changing it? I wouldn't mind the present AI behaviour if I could find a good argument to rationalise this behaviour (realism or gameplay based argument). And yes, I'm happy that AI's don't make (very) stupid choices based on their favourite civic. The game needs some balance between a smart AI and a roleplaying AI. Finding that balance will always be tricky. At present, with the availability of both the normal and the aggressive AI, I think this balance has been quite good for the various types of civ-players. Not yet - could you upload your testbed? I don't know, and that's about the only detail that keeps up my skepticism: I don't understand *why* and *how* the change you propose solves the problem. I just used GatlingGun's attached 1500AD save from the first post of his Unfavorable trade policies thread (that's where I noticed this problem first) and self-pillaged my Iron to get Justinian's through a trade. But just as GatlingGun's second trade screenshot says, Justinian also redlines his Iron in my game with a DENIAL_ATTITUDE ("We just don't like you enough"). But he should not do this, because according to the XML he must allow to trade strategic resources if he is better than CAUTIOUS with me (for what price is another question). In the save I have an attitude value of +11 with him that can be increased to +15 by gifting techs. But no matter how high/low the values are, if the diplo screen tells me he is FRIENDLY with me, then this must be his one current attitude towards me referring all aspects of the game and there must not be any other deviating internal and invisible attitudes created by hidden modifiers. (btw to get down to CAUTIOUS which would be necessary for his denial response the hidden modifiers would need to be at least -13!). So my first guess was that this might have something to do with the fix of the multiple corporation resources bug (Iron = Mining Inc.) To test this I gave Justinian 2 Ivory via WB and asked for them, but no, DENIAL_ATTITUDE for that too. Then I tested combinations of happy and health resources and various leaders and attitude thresholds which all let me assume that the leaders always treat me as if they were CAUTIOUS towards me when trading for bonuses, civics and religions. Inspecting the SDK I figured that these are the cases when the denial is a function of the AI player's attitude towards the human player whereas other trades such as for maps or techs ask for the attitude of the AI player's team towards the team of the human player -- and these trades work fine! So I modified the code for the bonus trade to ask for team attitude and bingo - I can get Justinian's Iron! I have absolutely no idea why AttitudeTypes CvPlayerAI::AI_getAttitude(PlayerTypes ePlayer, bool bForced) always returns ATTITUDE_CAUTIOUS even though this method appears to be called during the calculation of the team's attitude. If anybody wants to test, I attache the modified dll. Note that this is version 19 of Solver's patch, but it also includes my corrected variant of the Collateral Damage calculation (Drill2-4 don't render unit CD immune), the free preserve induced growth of forests over roads/railroads and modified global warming (Recycling Centers and Environmentalism reduce it). I'm not really C++ savvy and don't know if this modification might lead to other problems, but I think for tests it works fine. Wasn't it the case in vanilla and warlords? DanF5771 definitely has a point here. I agree that this is a bug and had been noticing it in my games before but had not looked into it carefully until now. In my current game the AI is not trading ivory to me even though he is friendly (and I don't have any vassals), giving the same denial message "we just don't like you enough". On the other hand, another AI did trade me luxury resources even when he was annoyed but he wasn't supposed to (because Montezuma needs to be cautious to trade that resource as defined in the xml). The fact that the player attitudes function returns 'cautious' regardless of what must be the culprit here. I can post a save if necessary. If people are convinced that this is a bug about the incorrect/buggy attitude function (i.e. the player attitude instead of the team attitude) being used for resource trades and civic changes, could it please be fixed in the unofficial patch? I like DanF5771's solution by using the team attitude for everything since that function seems to be working correctly. Ok, I think I have further encircled the problem of the erroneous determination of an AI's attitude toward other players. with the ePlayers's ID passed as the int iAttitudeVal argument! 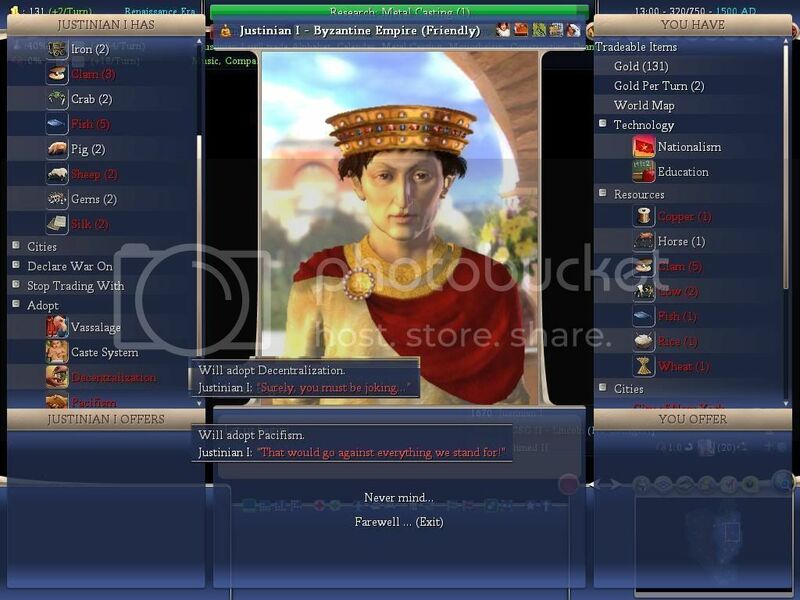 always return ATTITUDE_FURIOUS and playing a WB-scenario with 10 AIs as the 10th AI (Pacal II). The ID=10 gives me a virtual ATTITUDE_FRIENDLY during those trades, which lets everybody trade everything. so there is no need to ask for team attitude as proposed above. There might be a better way--I'd like to leave this to the experts. thank you for all your efforts to investigate this bug. I never noticed it, but it has definitely a tremendous impact on gameplay. I hope that this can be fixed soon. I also think that it would be great, if this "we-wont-change-our-civics-as-we-run-our-favorit-civic-thing" could be fixed. In my opinion this is a bug too. Thanks 77alex77 for agreeing/support. Apparently we are a minority and others don't bother too much. The favorite-civic thing is easy to fix with the small code changes proposed above, you can see Justinian is willing to adopt Vassalage and Caste System. It's just up to Solver to implement or not (maybe in a better way, because I'm just a C++noob), so I'd love to hear opinions from other players. If I understand you correctly, for initiating or refusing a trade, an AI will always consider that his attitude toward you (or your team) is 'cautious'. I think this is a bug that should be fixed. The AI should use (as it is doing for everything else) the real attitude toward you (or the average for your team if you have vassal(s)). On this one too I would tend to agree with you and I think that it could be changed. However, according to Solver, it has been made like this for the civics by design, so this is not a bug but the intended gameplay. That's why I think that a modification wouldn't be a bugfix, but a gameplay change, which is beyond the scope of this patch. Maybe we could have two versions of the patch, with and without this, but I guess it would be a nightmare for Solver to update his patch if he has to take care of more than one version depending of what each one prefer. 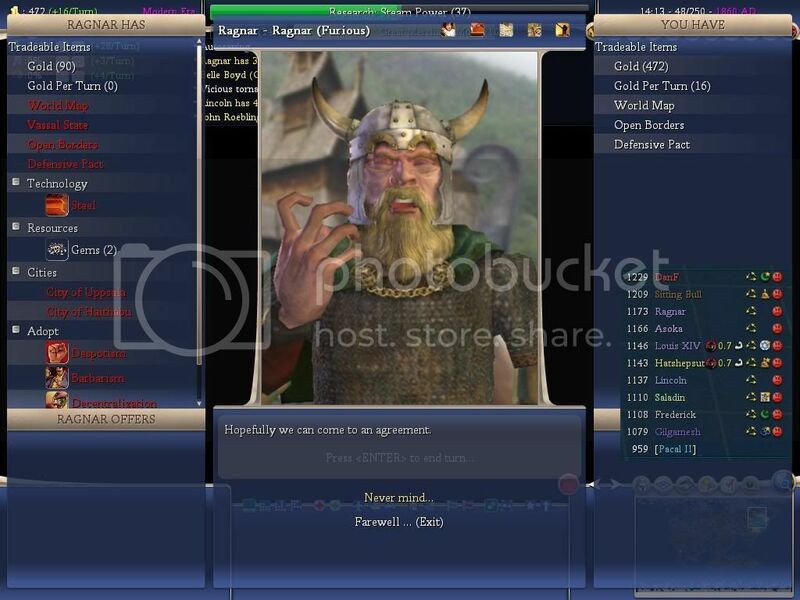 The multiple version problem is already here for the 50 civs dll, so maybe we shouldn't aggravate it. I don't know what to do about it because I disagree with the gameplay choice, or, more precisely, I don't understand it. If I understand you correctly, for initiating or refusing a trade, an AI will always consider that his attitude toward you (or your team) is 'cautious'. Actually it also affects AI to AI trades: The AIs with 3>=ID<10 will always get a virtual attitude of PLEASED in trades with other AIs and AIs with IDs >=10 will be FRIENDLY and thus never be denied a trade due to the leader's refusal thresholds. However, according to Solver, it has been made like this for the civics by design, so this is not a bug but the intended gameplay. That's why I think that a modification wouldn't be a bugfix, but a gameplay change, which is beyond the scope of this patch. IMHO it is much more likely that this was an oversight of the developers than a true intention for gameplay. The AIs will even deny trades to get them out of the inferior starting civics (Barbarism, ...) with this "That would go against everything we stand for" response in times when they run their favorite civic and haven't decided to switch civics in the other category yet. I don't see the improvement in gameplay that comes with this big restriction of one's possibilities to influence the diplomatic situation in the game. DanF, do you know whether these bugs also existed in the official version BTS 3.13? At any rate, I would advise you to also mention these 2 bugs in the new BetterAI project. The guys who revived that project are trying to improve the AI and it would seem to me that a fixed attitude in some negotiations may harm the AI. It can't get certain resources and can't influence some of the other AI's civics just because the real relations are ignored. That can't be good. Humans can often deal with buggy gameplay better than an AI can. The guys who are working on that betterAI are also more in the business of modding. While Solver may deem a certain change too far reaching or not following the intentions of the designers, these guys don't care as much about such considerations. They just want to improve the AI. They include the latest version of Solvers unofficial patch in their work and there is some level of cooperation between Solver and the BetterAI team. About the only thing I can contribute here is total and absolute agreement with you that BOTH these things are bugs, and should be fixed.